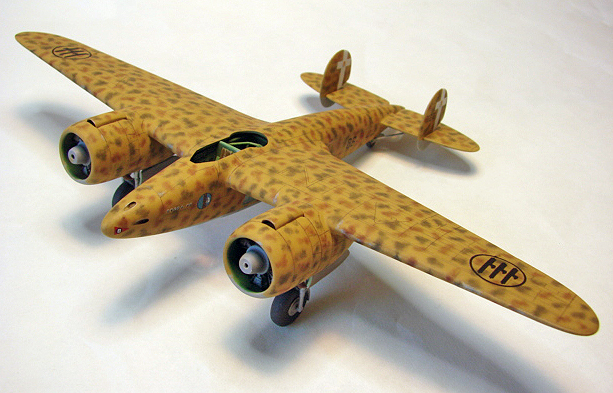 I model in 1/72 scale and have developed a technique for mottling aircraft that doesn’t require paint or an airbrush. I use artist’s pastels. After the base coat of sand is airbrushed and flat coated (I use Testor’s Dullcoat), I take an Xacto blade and lightly scrape along the pastel stick until I have a small mound of powder. Pastels come in dozens and dozens of colors. But, you can actually mix shades of pastels to achieve the correct color needed. When that's done I use a small brush to apply the pastels. You need to cut off almost all the bristles until you end up with barely anything remaining. 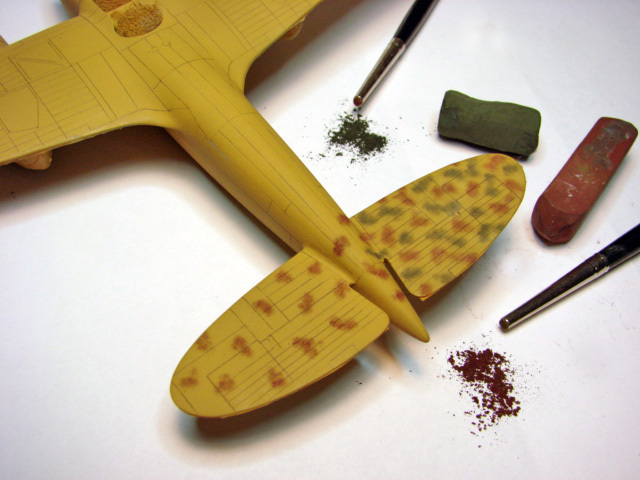 The end of the bristles should be flattened like a stippling brush used for stencils. Dab it into the pastel powder and apply to the model using a dabbing motion until you build up the color. I usually apply quite a few "spots" at a time and then use another larger and softer bristle brush cut the same way to soften and blend them. Then I repeat this process over and over again until it's all done. I use white cotton Photographer’s gloves while doing this to keep the model free of oily fingerprints in the areas yet to be done. When finished, I seal them with Testor’s Dullcoat, spraying slightly away from the model at first, and then applying a heavier coat. You can see some of the mottling forward of the tail has yet to be blended. It takes me several sessions over a few days to complete the task. Believe me, after a while you’ll need to take a break. It just so happened I had acquired a very large number of different colored pastels along the way. I'm not sure how I came upon this idea. Maybe out of necessity, because airbrushing this type of camouflage is beyond my scope of talent. Especially, since I use a single action airbrush. I never got the hang of the double action. 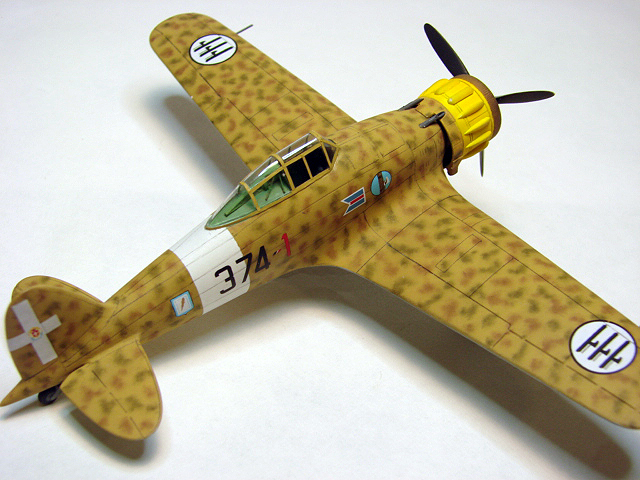 I also use this technique on Luftwaffe mottled camouflage. I've been using this method for years now. Like everything else about modeling, I've gotten better using this method over time. Some of my earlier work is less convincing. So, if you give it a try, don't be disappointed at first if things don't turn out the way you want. It will take some practice. After dull coating, I continue building just as if I was using paint. This only works using darker colored pastels over a lighter base color, not the other way around! Check out my member’s gallery to see the completed Breda as well as a few other builds completed using this technique.